Page File El Reg bookworm Mark Diston is joined by Andrew Orlowski to review the pick of publishing this week. A compilation of works from mysterious Stark Houghton tells tall tales of the wild west. Mac users can brush up their skills or get a break from hapless relatives with the latest from Bob LeVitus. And music lovers get a down to earth view of the indie scene from The Fall's bass player Steve Hanley. The mysterious and androgynous Stark Houghton is ”the pseudonym of a thrilling new voice in fiction”, according to the publisher’s blurb. The western genre has been done to death over the last century, though occasional outsiders have breathed a little life into its ailing corpse. One has only to think of Sergio Leone’s spaghetti remixes and Tarantino’s Django Unchained. Nunslinger is not the first western to feature a heroine in a habit. You only have to cast your mind back to the repartee of Katherine Hepburn and John Wayne in Rooster Cogburn or Clint Eastwood and Shirley MacLaine in Two Mules For Sister Sara to realise that wimples and westerns are part of a long tradition. 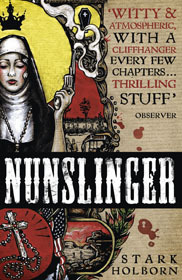 Nunslinger is the story of Sister Thomas Josephine who is travelling to Sacramento on a wagon train, which is attacked. She is rescued/abducted by Abe Muir, a ne’er-do-well with whom she conducts a passionate and platonic affair. The strange couple are falsely accused of murder and embark on a life on the run, attempting to clear their name. There is a supporting cast who follow our intrepid duet across the western states and into Mexico and back. Among them is Frederick Templeton, an early tabloid journalist who retells the spiced up tale of the “six-gun sister” in The Californian newspaper; Lt. Theodore Carthy who seems to rival Abe Muir in his passion for the renegade sister; Windrose a corrupt railwayman and Owl, a kind of Navajo Ninja squaw who turn up in the most unexpected times and places, slitting reprobate throats. Nunslinger features more twists and turns than the coast of Norway – just when you think our heroine has had her chips, a most unlikely series of events save the nun to sling another day. At 600 pages, it is a tale divided into easily consumed short chapters which are titled in a biblical fashion – these were previously sold as episodic eBooks of around 80 pages and larger omnibus editions, hence this being the "complete" version. The prose is without too many flourishes, though there are a few gems hidden away: “The man behind the counter looked like a weed beneath a rock”. Native Americans are described as “featherheads” and some poetic scenarios: “Trees ... gathered up the sunset like a miser raking coins”. But mostly the wordplay does not interfere with the storyline, which cracks along at an impressive pace. Sister Thomas Josephine tries to be upright, but at every turn the body count rises as the reward on her head grows. Despite her attempts to do good, Sister Thomas Josephine just ends up in more trouble. The final denouement is left just open enough to allow for Nunslinger 2 – the sequel. Stark Holborn may not be the "thrilling new voice in fiction” that the publishers claim, but he is a compelling storyteller who keeps the readers' attention throughout this long and twisted tale. It is more likely to appeal to fans of Messrs Leone and Tarantino than those of the Johns Ford and Wayne.